Deep in the Mexican jungle, Chacchoben is among the most famous ruins in Cozumel. 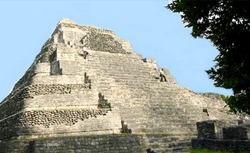 These ancient pyramids have been excavated and restored, and now stand as testament to the myths and rituals of the mysterious Mayan peoples. Fascinating day led by Diego Z and driven by Hugo. We boarded a modern air conditioned bus and were briefed by Alvaro Sosa about the Mayan culture and the ruins we were about to see. Very interesting. We climbed several of the Mayan pyramids. fantastic tour was given bu daniel jr. Very interesting. The guide provided great details about the ruins themselves and the Mayan people. My husband chose to hike the Ruins and he loved this excursion! In Costa Maya we did the Mayan Ruins and Blue lagoon. Booked with Native Choice, about a 10 minute walk from the port. Climbed the Mayan Temples. Fascinating history. Walked through the Jungle area. Very breathtaking. Fantastic Mayan history. The ruins were breathtaking to walk among and see. Bus ride to/from was on a very nice custom coach. Tour guide was excellent, very well spoken and informative. Great trip. Daniel the Jaguar was the best!!! Daniel the Jaguar was the best!!! We learned so much and had a lot of fun!!! There are a few pyramids but not much else to the site. One hour drive in air conditioned bus to Chacchoben Mayan Ruins for a guided tour. Enjoyable. The ruins were amazing. Educational. Bus ride a little long. 4 hour trip - 1 hour to the ruins and one hour back. 4 hour trip - 1 hour to the ruins and one hour back. 2 hours spent exploring Mayan ruins. Frederico was the tour guide - very knowledgeable! Tour we chose was 85 bucks per person, they had other options. Tour we chose was 85 bucks per person, they had other options. The ruins were fantastic, they are relatively new and remote, so there weren&apos;t too many people. Guide knew a lot about the history and language of the Mayan people. Chacchoben Mayan Ruins Deluxe – Well Worth It! Took the Deluxe tour with Jacome.